Loud Hydroelectric Dam is one of four hydroelectric dams owned by Consumers Energy and adjacent to River Road. The dam creates a large impoundment which has enhanced fishing, sailing, and boating along the Au Sable River. 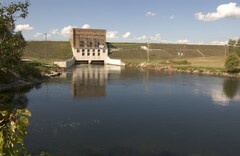 Recreation facilities at the dam include boat access to the pond.